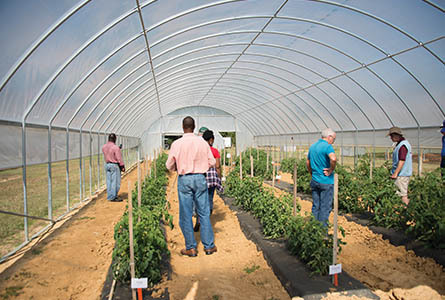 The Truck Crops Branch Experiment Station, one of the 16 branch stations of the Mississippi Agricultural and Forestry Experience Station, provides essential information to horticulture growers through the MAFES Official Variety Trials. Rick Snyder, extension and research professor at the Truck Crops Branch Experiment Station, said researchers are gearing up for the 2015 trials. 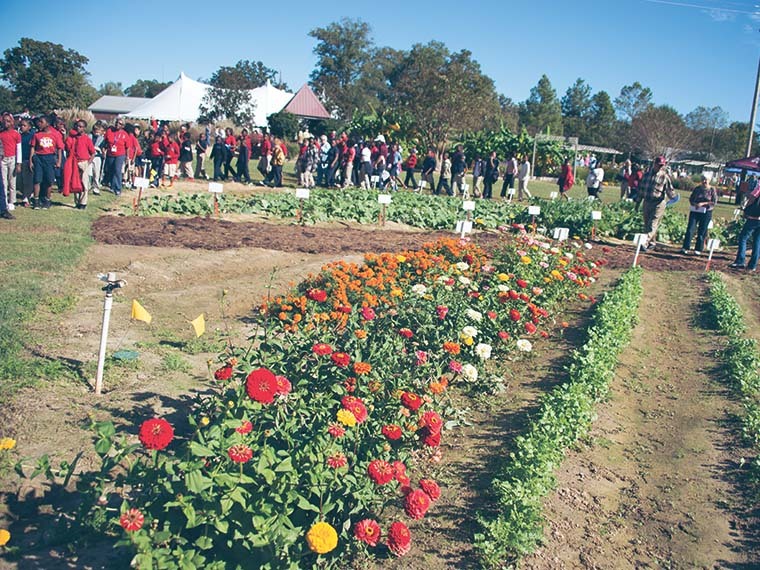 Shaun Broderick, assistant extension and research professor at the station, heads up the ornamental horticulture variety trials, focusing on annual flower and bedding plant trials in particular. Broderick said most varieties are newly released for 2015. Growers can utilize the station’s new online database for the first time in 2015. The database will showcase the performance of the plants throughout the growing season. Attendees at the 2014 Fall Flower and Garden Fest tour rows of flowers and vegetables; attendees tour a high tunnel at the station. The station is also adding new trials of plants in containers. Broderick said this year’s trial garden will include nearly 130 varieties of flowers including hibiscus, dianthus and petunia, to name just a few. Bill Evans, associate research professor at the station, manages the fruit and vegetable variety trials. In addition to research in the field and greenhouses, scientists also conduct research in the high tunnels, which Evans oversees. Researchers at the station are also testing a prototype machine that delivers compost and chicken litter fertilizer in bands close to row-crops in an effort to improve fertilizer use efficiency and reduce runoff. The development of a plant breeding program is in the works as well.